What makes one story ordinary and another a page turner? What makes characters come alive to readers? How can reconsidering the motivations of your characters add depth to your story? What kind of conflict will sustain a novel length story? 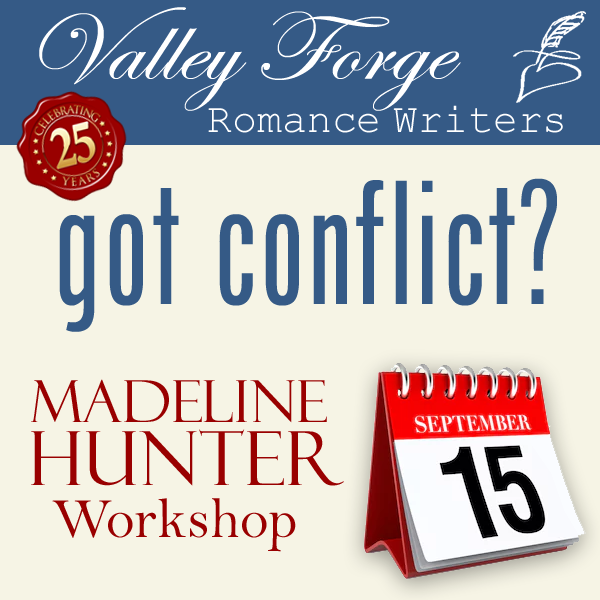 Join Madeline Hunter in her full day workshop where she will discuss all of these questions and show how essential decisions about conflict, motivation and characterization are among the ways to take your writing to the next level. Specific examples and hands on sessions will help writers to see how you can reinvent a story idea to make it more compelling and "big book." Bring a work in progress or a new story concept and leave with a conflict driven synopsis for a book that will wow readers and captivate editors. Are you a romance author? Would you like to become one? Have you published many books and crave the company of fellow writers? Or have you begun your first manuscript? We're just like you. If you're interested in learning more about VFRW, send an email to info@vfrw.com and we'd be happy to answer your questions. VFRW usually meets on the first Saturday of every month (except June, July and August). Our meetings give members a chance to network and socialize with fellow romance authors, and we host a speaker who talks about the craft writing romance. The Valley Forge Romance Writers (VFRW) is a non-profit organization dedicated to providing fellowship, support, and educational opportunities for its members. The purpose of VFRW is to promote excellence in romantic fiction, to help writers become published and establish their career in the writing field, and to provide continuing support for writers within the romance publishing industry. We are a local chapter of the Romance Writers of America and abide by the regulations and philosophy set forth at the national level.